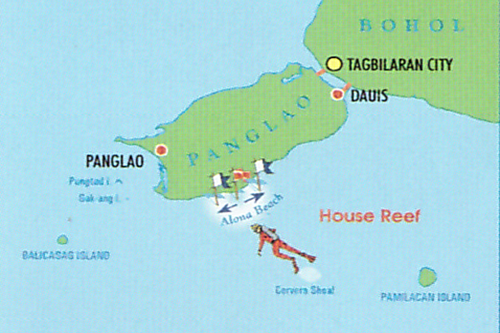 One can take the jeepney or car to get the dive site, in case of rough waters on Alona beach. Wall with cathedral Virgin corals. Great for shallow-water photography. Be careful with your entry, it can be shallow. When you go by car and plan a land-dive walk carefully down cliff with fully equipment it can be slippery. Your entry and exit points are the same. Good chance to see young Barracudas and Banner fish. Entry/exit can be difficult when the “Amihan” wind blows. Many giant sea fans, bucket sponges, elephant ear coral and green leather corals “anglerfish” can be spotted. 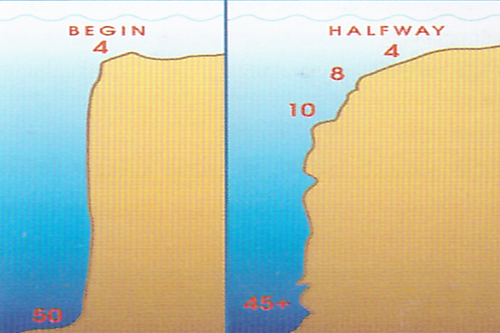 Watch your depth at the beginning of the dive, its here easy to go “too” deep. Watch the blue water for mackerel and squid or young Barracudas. In deeper water there is a good possibility to see sharks, white tip or hammerhead. 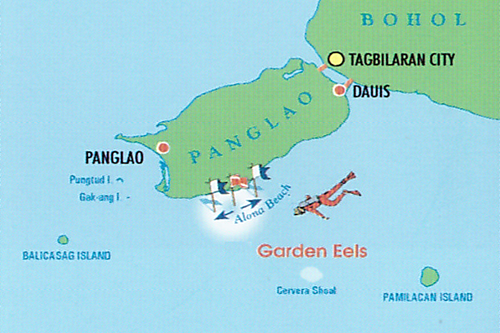 Also possible by jeepney or car, land entry and exits are simple to make but be careful at the reef top. 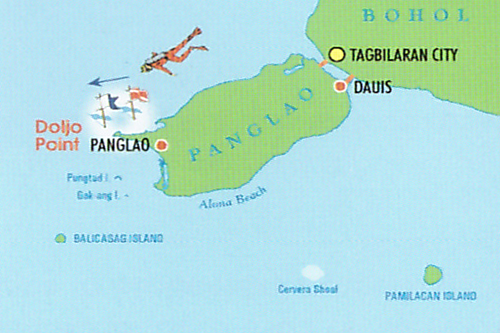 By boat, the trips looks long because it has to go all the way around the shallow east tip from Panglao. The outrigger boats can not make a short cut except at maximum high tide. Entry point is when you see the fishing hut on pillars in the water standing in line with the south point from Panglao baring 125˚. Beautiful hard and hard and soft coral garden. Lots of small fish like Anthias, Raggy Scorpion fish, Ribbon eel, One-stripped fusilier. At the end of the dive it can happen that you have a slight current against you, return in shallow water in south direction if its getting too strong. Great place to make your safety stop, much to see on the shallow 4m sandy pads. You can bring a dive light to look in the small caves along the wall. Dive Direction : Normally start the dive at the “Habagat” wreck at 35m, then come up along the sandy slope in north/west direction to the “S” shaped wall with overhang, keep the wall on the right shoulder, going west. Watch your NDL if you plan to dive the wreck that was sunk by Seaquest Dive Center in the year 2000. You can bring a dive light to look in the wreck and the small caves in the wall. Swimming above the wreck are Tall fin Batfish, under the wreck Big Lion fish, one Giant Anglerfish and many different kinds of cardinal fishes in the wreck. At the “S” shaped wall look for Anglerfish and at the end of the dive on the slope, look among the feather stars for the Harlequin Ghost Pipefish. 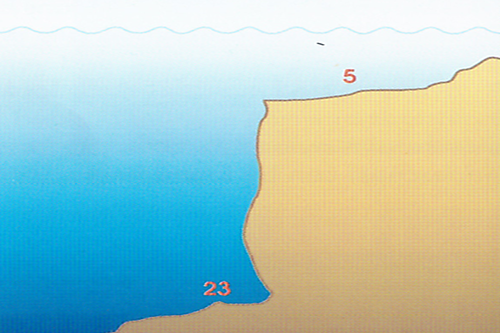 Dive Direction : Start the dive with the slope on the right shoulder, going south-west. This is a long dive site good for two dives. Its connected to Danao Beach. Nice blue and table corals, sea fans Brown Daisy coral, some Dothead Rockcod and small Barracuda. 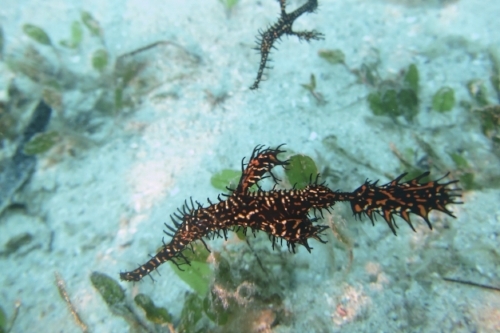 With a good dive-master also the black and yellow “Harlequin Ghost Pipefish”. 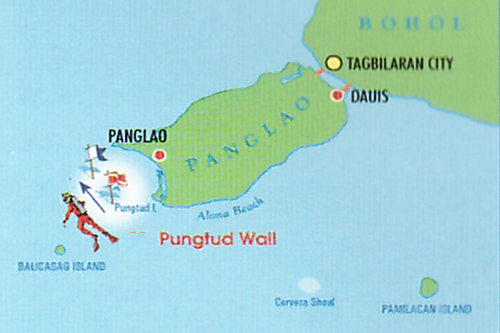 Half way the wall, look in caves and crevices for the “Comet” and the Banded Pipefish. In thew months of May and June the aggressive Blue-Finned or Titan Triggerfish can be found here. Great dive site for night diving. This spot is the west side of Alona Beach approximately 110m off the beach. In the beginning a beautiful bows shaped cliff, look for Nudibranchs. Beautiful coral garden on the top of the top of the wall with lots of small fish like Redfin-Amethyst-Purple Anthias. At the bottom of the sandy slope the splendid sand eels and spotted Garden eel. Dive Direction : Start the dive with the wall on the left or right shoulder. 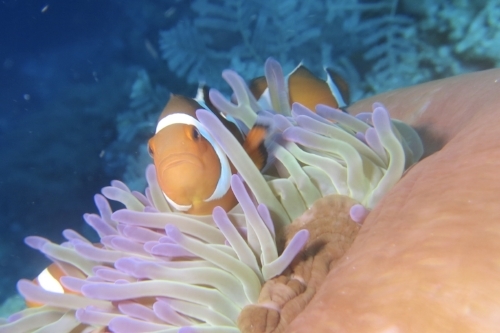 Right in front of Seaquest Dive Center is a beautiful house reef, great for introduction, check-up or night dives. 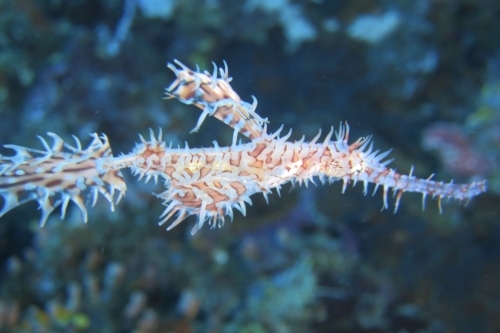 For sure you will see during the night dive some basket stars, Harlequin Ghost Pipefish is a good possibility. Baby Barracudas, many reef fish like the Purple Queen Anthias fish or Moorish idol or the Regal Angelfish. Unfortunately the reef is a bit affected by the many boat mooring ropes, which has damaged some corals. 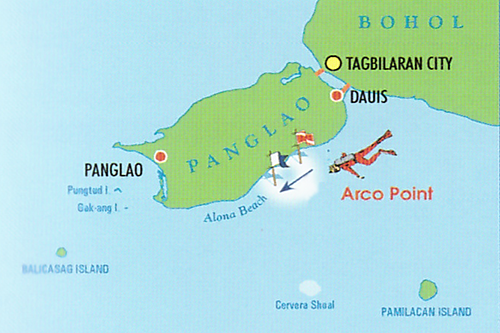 The dive site is the right in the front of Bohol Beach Club. At the end of the dive there are two small jeepney car wrecks. The first one is at 10m with the roof laying next to it, the second one is turned upside down at 8m. Very special on this dive are the Brown Daisy coral; or the pygmy seahorse which can be seen with the assistance of a good dive-master who knows there whereabouts. You are also guaranteed to see schools of Sergeant Major fish, Black Damsel Fish, occasionally the banded snake eel and on the sand slope the black and blue lined Nudibranchus. 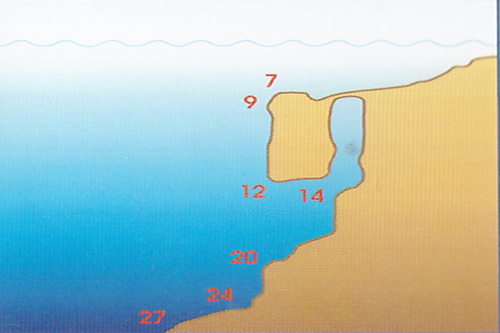 Dive Direction : Start the dive with the wall on the right shoulder, going south-west. After circa 30min diving steep slope, assent to 10m. At the beginning of the dive is a hole in the wall. Enter the cave in small groups from the wall side. The drift current is always going in the south direction, it can be strong sometimes. You can bring a dive light to look in the small caves. The cave is teeming with cardinal fish and Sergeant Major Fish waiting to be fed. Inside the cave on the east side are White-eyed moray eel, and two Black-finned Snake eels. Around the top entrance, at 8m, are sometimes well hidden the Raggy Scorpion fish. Along the wall are goupers, wrasse and butterfly fishes. 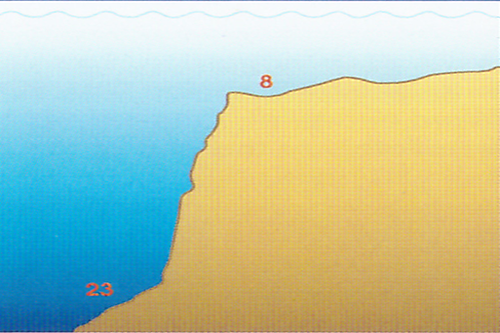 At the end of the dive when the slope starts look in the shallow for Anglerfish or “frog” fish, between 5 and 10m.